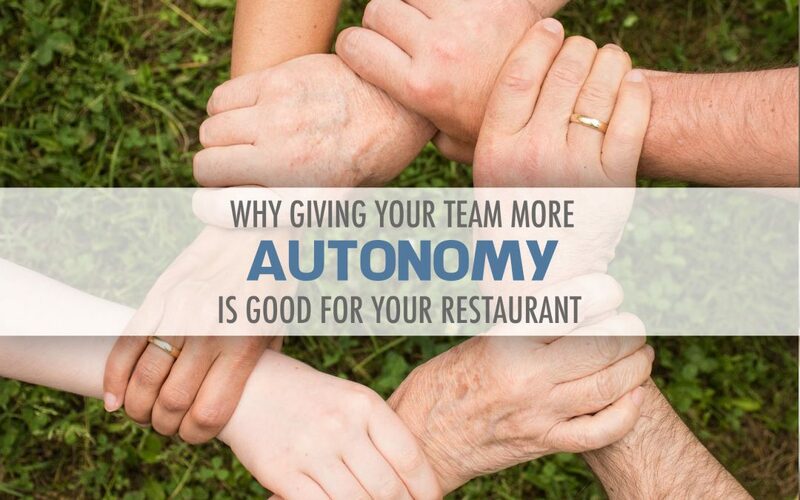 When a business can give employees autonomy and independence, they are more likely to work better. Statistics show that companies that adopt autonomy regularly at work are happier and more productive. When a business – particularly a restaurant – fills roles with the right people, the entire business can transform. Autonomy is the feeling that your work belongs to you. You’re not just going through the motions for someone else, but instead, you’re controlling the way in which you do your job. Over 59% of restaurant operators indicate that staffing is one of the top challenges to being successful. By giving your employees freedom to manage their specific tasks and responsibilities, you are giving your employees ownership and accountability of their actions. When an employee can view the chance to work with your restaurant as an opportunity, not a requirement, you will maximize the most out of that particular individual. Open up schedules to the entire staff to pick and choose what time works best for them. Teams who work together to achieve the final end goal are more likely to succeed than those who directly compete internally. Being clear and firm with your approach and management style — and having a system to hold people accountable for results — are essential for autonomy to flourish. It costs your money to lose a staff member. The cost of hiring and training an hourly employee goes far beyond the waitress or waitress salary. In fact, hiring and training a new restaurant staff member can cost as much as $3,500. Each person on your staff is different, and you must respect that. You might have some employees who thrive during the morning hours while others prefer working on the weekends or the afternoon. Taking the time to understand and know each employee’s individual preference will help your restaurant staff operate efficiently. There might be a time, though, that a staff member will have to cover for someone else – and it won’t be an issue. Effective autonomy empowers employees to tap into meaning that goes beyond just being an employee. Scheduling aside, you will have to set the tone of the working environment. Will you be fun? Authoritative? A micromanager? Trustworthy? As the owner, you will need to convey a sense of professionalism while also giving your employees the flexibility they desperately crave. People react better when they are lead versus when they are managed. By developing a healthy internal company culture, you are on the right path to hiring and retaining happy employees. Without trust, autonomy is impossible. If you believe in the success of your restaurant, communicate that to your staff. Your passion and motivations will encourage others to feel the same way. Employees want to understand the business’ values and mission. To get your staff on the same page, create encouraging and motivating training documents when they first begin. This sets the tone to the type of person and establishment they are working for. You are empowering your employees to represent your restaurant, your brand, and ultimately YOU by giving them the support they need to be positive. Take the time to learn more about how to be a good leader in your industry and begin building those relationships with your employees.